1. Adjust chair height so that your feet are flat on the floor. Use footrest if you can’t achieve this. 2. Keep your wrist posture neutral. 3. Keep your monitor between 20 and 40 inches from your face. 4. Adjust monitor so that the center sits at eye level. 5. Place your keyboard so that your upper arms are perpendicular to the floor. 6. Chair is adjusted to keep body supported in an upright position. 7. Back rest is adjusted to fit the lumbar region of your spine. 8. Keep work within 16 inches of your body. 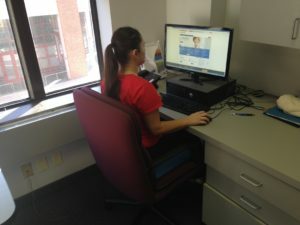 How ergonomic is our Harbor PT employee Liz? Sitting for a long period of time can put a strain on your back causing lower back pain. Listed below are some tips to reduce strain on your back while driving. 1. Avoid driving for more than 2 hours. Get out and walk around and stretch your legs. 2. Adjust your seat from time to time. 3. Use a lumbar support or seat cushion. 4. Short drivers can purchase a pedal extension to improve their sitting posture. 6. Move your seat up to avoid slouching. 7. Heat your seat to provide warmth to your muscles. 8. Ice your back when you get to your destination.